Denna produkt ger dig 388 bonuspoäng. Märklin Start up - Märklin Start up Club Annual Car for 2017, längd över buffertar 11,5 cm. Start up Club 'Bundesliga' annual car with an image of all of the club logos for the 2017/2018 season. 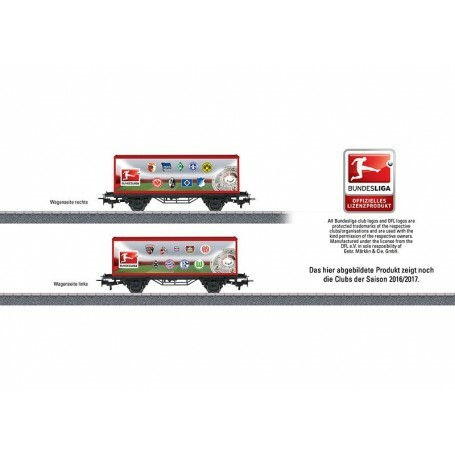 Model: This is a container car in a Bundesliga paint scheme with a representation of all of the club logos for the 2017/2018 season. The car includes a 30-foot container superstructure. The car has Relex couplers. Length over the buffers 11.5 cm / 4-1/2'. DC wheel set E700580. Annual model for members of the Märklin Start up Club and for Märklin Insider. This car goes with the 'Bundesliga' diesel locomotive available under item number 36655 and with the car sets, item numbers 44812, 44813, and 44814.